Delete a bill: Click the red X. Suspend or resume a bill: Click the yellow S.
Change the order of bills: Click the yellow up or down triangles. Bills are worked in top-down order. Bills missing an ingredient will be skipped. Once a bill is satisfied, the next one will be worked. Hovering over a bill with a restricted ingredient radius will outline the limited area (if small enough to see on screen). Assorted bills on a machining table. Change the mode: Choose 'Do X times', 'Do until you have X', 'Do forever'. 'Unpause at: x' will automatically resume a paused bill when the quantity drops to that number. These settings allow you to keep from having too much or too little of a given product, with little or no further management. Click [Details] to change the bill's default configuration. Set ingredient radius: Sets the maximum distance at which pawns will get ingredients. Allowed skill: Sets the minumum and maximum skill level, usually to prevent pawns with low skills from making poor products. Hit points: Sets the minimum and maximum percentage hit points for ingredients. Ingredients: Sets which resources can be used on this bill. To add a bill to a living creature click Health, Operations, Add Bill. Note: this only applies to colonists, pets, prisoners, downed friendlies, and downed animals. 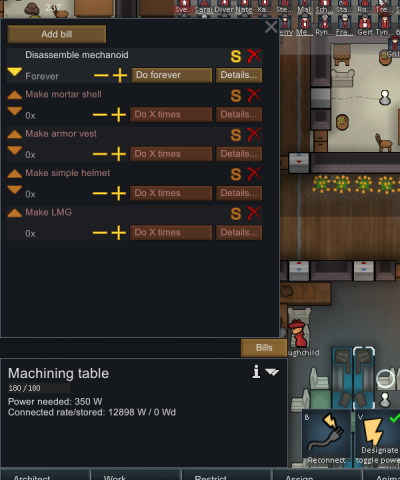 To add a bill to a downed mechanoid, click Health, Modifications, Add Bill. Certain body parts can be harvested and sold or transplanted to another pawn. However, damaged body parts cannot be harvested. Any bill for an operation requires medicine. By default, the best allowed medicine (see Health|Overview) for animals and non-colonists is herbal medicine. If the appropriate medicine for that pawn is not in stock, doctors cannot carry out prescribed bills. Attempting to prioritize the operation will state 'Cannot operate (need material)'. Either ensure the right medicine is in stock or adjust the pawn's allowed medicine. This page was last edited on 28 October 2017, at 23:35.